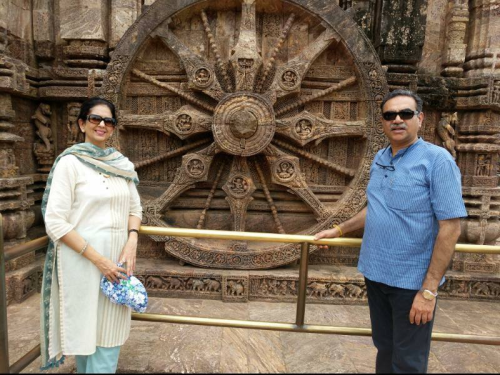 I remember my school history book having a picture of the wheel of the Sun God’s Chariot at the Konark Temple at Bhubaneshwar. Many a times I would fantasize about seeing it for real. Over the years, whenever a picture of it would catch my eye in a magazine or on TV, I would look at it in awe and wonder if I would ever get to see it. I doubt if I ever voiced my desire to anyone. Coincidently, the opportunity to visit Bhubaneshwar sprang up all of a sudden as the city was chosen by the BJP to have its National Executive meet on April 15thand 16th. My husband Sanjay, was to attend the two day summit and he asked me to join him on the 16thevening, just when the meeting was to get done and over. Resultantly we had the good fortune of visiting the Lingaraj Temple, The Jagannath Temple and also the Sun Temple at Konark. Due to paucity of time we visited Konark around noon. It was not really the right time because it was terribly hot but it was perhaps the right time to see for ourselves how the ancients measured the time as per the shadow of a stick held onto the wheel (because the sun was overhead at that time)which they used as a sundial. What I didn’t know was that the ‘Konark Temple’ was not really a temple; it was an archaeological site or a monument. It was a UNESCO world heritage site and was one of the seven wonders of India. The entire structure is apparently in the shape of a chariot, having twelve pairs of wheels. They are pulled by seven horses of which only one is there now. The idol of the Sun God seems to have been shifted out and is now installed in the temple of Lord Jagannath at Puri. So, the temple was a ‘temple’ without the deity in it! We looked on as our guide told us in detail about the figures carved into images of kings, queens, men, women, children, horses, elephants, lions, tigers, flora and fauna … There were panels and panels of sculptured plaques all around the structure. What struck me was that the faces of figurines had different pedigrees of features. In some panels the faces bore features that were typically Indian. Others had features that were Chinese. Yet others were Mongolian and some Buddhist and even Indonesian. It was proof of the fact that the artisans who had made these panels were from different cultures and origins. Strangely, a thought came to my mind. How, tolerant and accepting of others views the Indians are! How large hearted of them to allow another’s culture and ideas be reflected in a structure of this magnificence! And then … isn’t this tolerance the very reason that India has had such a glorious past, where people of all ideas and mind sets lived in harmony. Yes! Here each one lives for the other and everyone lives for God. Barring some misled individuals, Indians are a very tolerant race! We believe in Ahimsa Parmo dharma! Non-violence is the ultimate duty … this essentially refers to non-violence and tolerance in thought, word and deed! As we mused around and saw the array of depictions in the stone sculptures, I could almost feel the presence of the artisans who had toiled so hard to create this marvel for posterity. The scenes varied from war, marriage processions, children playing, meditation, erotica, conjugal relationships, washer men, fishermen, water bearers … the portrayals were endless. There were a myriad stories being told by those hands who were no more, but had created so many intriguing stories that could invoke anyone’s imagination. As I stared starry eyed, at one of the wheels of the Sun’s chariot and peered into the timeless intricacies carved therein with incredible precision, my head bowed in reverence to those hands that had left behind this visual extravaganza for us. A song from an old Hindi film played in my ears, “Geet gaya patharon ne …” I have not seen the movie nor do I know the circumstances in which it was sung, but it seemed to be just apt for the stories unravelling before our eyes. Back home, as I write this, I silently bless all the craftsmen who left a part of themselves in that laterite stone and put life into the lifeless. Come to think of it, the form of the sculpture is innately present in the stone. The unwanted portions have to be chiselled away to reveal the form within. Isn’t this what life is all about? Removing the unwanted from our persona to reveal the divinity immanent within us? In case of the self, the sculptor could be the self or a fault-finder, a well-wisher; a parent, a friend, a mentor or a Guru! Each sculpture in stone was the personification of a lesson that was timeless! As I think of the co-incidence of incidents that led to my flying visit to see the famous Konark temple, and the beautiful Lingaraj Temple as well as Jagannath Temple (which is one of the four Dhaams of the Hindus), I am overwhelmed at the way everything fell into place. They say that one can do a pilgrimage only when God wills it. And I smile to myself … a little girl’s dream had just come true, and with so many add-ons!